It is getting closer and closer to Autumn. I know this is so because some of the stores I have been patronizing lately have their Christmas displays out. This world of ours gets crazier and crazier! I was listening to the radio on my way home yesterday and heard the lyrics of a song that absolutely shocked and appalled me – and I am not a prude by any stretch of the imagination! There are no filters any longer and yes, it upsets me. I try to be the change I want to see but I don’t think I can do it alone! Enough on that topic! My grandchildren have all started back to school and it is such fun to see them adapting and learning. It will not be long before my little kindergartners are reading! Such an exciting time in their young lives! Please remember to be kind to others and help take care of the disenfranchised. You never know…someday you may need help as well. Thus far it does not seem a lot cooler to me except for sitting in my air conditioned office where I have to wrap a fleece blanket around my legs! I find myself longing for colder weather so my office will warm up! Until next time, take care of each other won’t you? Every time you save a document in Word, the information in the document properties is updated. Part of this enumeration is a count of how many instances the file has been saved. This is called the revision number. You can insert the revision number in your documents and have it updated automatically, if you so like. Place your cursor where you would like your revision number to appear. In the Text group, click the Quick Parts tool and then select Field. Word to display the Field dialog box. the choices in the Field Names list. In the Field Names list choose RevNum. 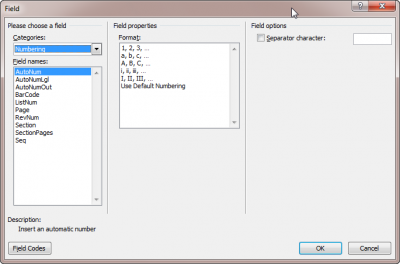 Click on OK to close the dialog box and insert your field. That’s all there is to it! You’re welcome!